As people age, the lens of the eye develops a progressive opacification or clouding called a cataract. Cataracts are a significant cause of visual loss in older adults, and often surgery is performed when the lens causes vision loss to the point where it interferes with daily activities. In most cases, cataract surgery is performed without complication. However, in some eyes, the cataract cannot be removed completely and fragments of the cataract may fall into the back of the eye where they cannot be safely removed by a cataract surgeon. Even the most skilled cataract surgeons have this happen—especially when the cataract is very firm or if trauma (injury) or other conditions have damaged the attachment of the lens to the inner wall of the eye. 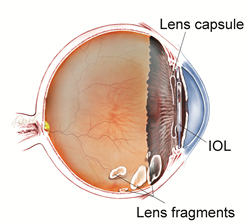 When cataract pieces (or lens fragments) remain in the eye after surgery, a severe inflammatory reaction can occur that may cause high pressure in the eye, swelling in the center of the retina and cornea, and even potentially permanent visual loss. In these cases, additional surgery is performed by a vitreoretinal surgeon who can safely retrieve the cataract fragments from the back of the eye. 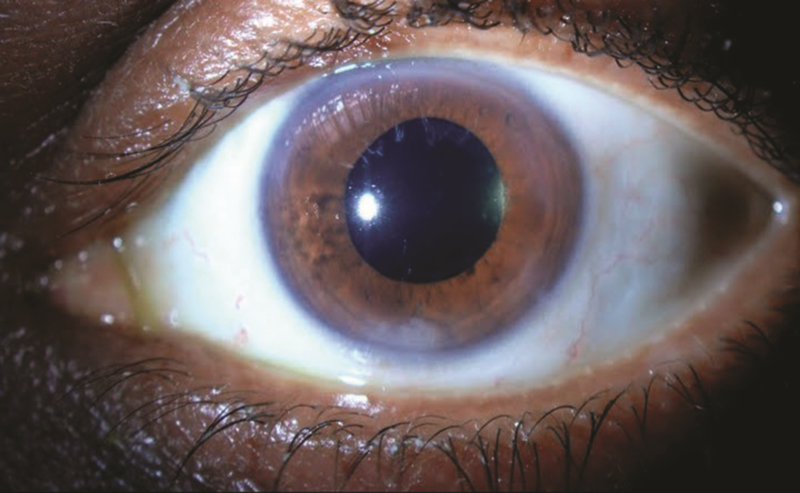 Proper timing of either medical or surgical follow-up care is crucial in providing the best possible outcome from this complication of cataract surgery. Patients can almost always see the lens material in the form of large floaters or debris (scattered fragments) in their field of vision. Again, proper timing and management become important in cases of retained lens material. Sometimes, surgery can be avoided with aggressive medical management using eye drops to reduce inflammation and elevated eye pressure, while allowing a small piece of cataract to dissolve on its own. However, if the remaining lens material is significant or if the eye pressure remains elevated, additional surgery should be performed. A vitreoretinal surgeon typically performs a procedure called a pars plana vitrectomy to remove the lens material. There is no consensus as to when a vitrectomy should be performed, but in general, vitrectomy is performed within 1 to 2 weeks after deciding that medical therapy with eye drops alone is not sufficient to solve the problem. Sometimes, an emergency vitrectomy has to be performed if the pressure in the eye remains very high despite medical therapy. A vitrectomy is outpatient surgery where the eye’s vitreous gel and remaining lens material are safely removed. The eye is filled at the end of surgery with saline (salt water) solution or a gas bubble, and the operation is typically very successful. The surgery causes only mild pain and only a small percentage of patients require over-the-counter pain relievers after the procedure. The vision is cloudy following vitrectomy surgery while the eye heals, but gradually improves. Complications are relatively uncommon after vitrectomy surgery, and include retinal tears or retinal detachment (1 in 100 patients). Infection and bleeding can also occur (about 1 in 2000 patients). Patients who have vitrectomy surgery are monitored carefully afterward to watch for these potential complications. Most patients who require vitrectomy for retained lens fragments after cataract surgery achieve excellent vision.